Having finished some of the “newer” Dragonlance novels, I have decided to return to one of the classics, The Legend of Huma. In the past I have always read this novel after Chronicles and Legends, but this time around I am avoiding the two original trilogies in order to focus on the “peripheral” stories. I have always found Richard A. Knaak to be one of the best Dragonlance writers and this one is in my opinion of the best ever written. I mean think about the characters: Huma, Magius, Kaz, Crynus and of course the renegade mastermage Galan Dracos. Furthermore we meet some ultimate dragons like Charr and Wyrmfather not to mention a young Cyan Bloodbane What’s not to like? From a gaming perspective there’s a ton of material that can be turned into some really exciting content. Unfortunately no one ever did. So be it. We still have a really good novel, which I have read several times and probably will read several more times. I finished Dragons of a vanished moon the other day. This is the second time I have read that book, and strangely enough, I liked much better the second time around. I think it’s because I rushed through the first time I read it. Back in the day, I just wanted to get through it and get to the part where the gods return. This time it was much more enjoyable to just enjoy the story and follow the progress. Having finished the War of Souls trilogy, I am still left with a weird feeling. Call me old fashioned, but I never really understood the change that the Age of Mortals brought. The whole Chaos aspect of the pantheon always seemed very out of place or perhaps a bit rushed, and that makes the story a little abrupt for me. On the other hand one could argue that Dragonlance really had nowhere to go after the Legends since the stories were so powerful. However, I still think it was a good time to move the setting forward. Anyway, killing of some gods and changing pretty much everything about the setting certainly changed that. 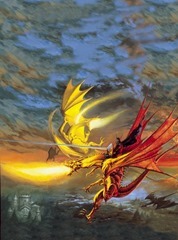 The Dragonlance we saw right before the setting died was much darker and grittier than we had ever seen. In many ways, the setting was left much more interesting than before and from that perspective, the Age of Mortals was a good thing. It ensured that Dragonlance left a beautiful looking corpse. Oh, how I have missed reading. It’s like massage for my brain. So, I am reading the War of Souls trilogy again. While reading the Minotaur Wars I felt like reading War of Souls, to see if I still felt the same way about it as the last time. 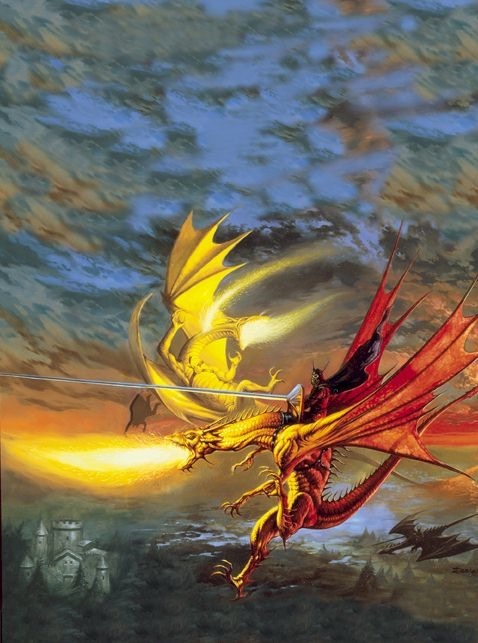 I was never a fan of what was done to Dragonlance setting during the 5th Age and Summer of Flame, but maybe the years away from Dragonlance would give a new appreciation of this age. Let’s see. I have only read a couple of chapters and I already dislike Silvan, perhaps more than the first time I read Dragons of Summer Flame. But, it is still nice to be back on Krynn.